As you can tell from the picture, this prop was done rather cheaply. It was a last-minute idea, but turned out very impressive in the dark and could easily be adapted into a more professional looking prop. 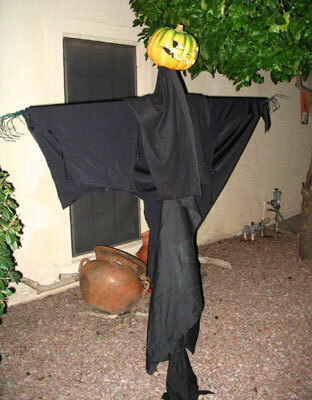 It was inspired specifically by one of the scarecrows in Tim Burton's version of "Sleepy Hollow". The pumpkin was one of those fake, hollow ones you'll often find at craft stores in Autumn. It was fairly easy to carve the jack o'lantern face in it with an x-acto knife. It also has a hole cut in the bottom to fit on top of the body of the scarecrow. The body is very simple, just a cross made of PVC pipe. (I have mentioned how incredibly useful that stuff is, haven't I?) The only connector needed is a cross junction, and then a few lengths of pipe for the arms, neck, and body. For this prop, I just draped several random pieces of black cloth around the pipes, held together with safety pins. The hands were made of wire - those were truly last-minute! They would at least need to be covered in latex mache (or something similar) for the thing to look better. Since the pipe is hollow, it was a simple matter to drive good sized garden stake into the ground, and slide the scarecrow onto that. Driving a small wedge in between the pipe and the stake kept the scarecrow from swiveling. Part of what made it look so good in the dark was the light in the pumpkin head. Around Halloween, you're sure to find several types of battery powered lights to use in lieu of candles in your jack o'lanterns. At night, this scarecrow looked downright terrifying! The illustration below shows how the scarecrow was made. Click to enlarge it.